AFTER A WHILE, by Wee Willie Walker and The Anthony Paule Soul Orchestra, is an album of great music, plain and simple. Great music. This is a stand alone CD, no comparisons, no peers. If comparisons must be made, Ray Charles, Sam Cooke, and Otis Redding might come to mind. The eight originals are fresh as are the five covers. 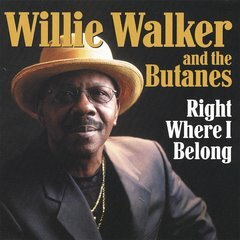 AFTER A WHILE debuts Wee Willie Walker’s talents as a co-writer, and coproducer. The honest collaboration between Walker and Paule gives listeners a musical feast for the heart and soul. On his most recent release, If Nothing Ever Changes, Willie exhibits his mastery of the soul idiom. Opening with the catchy Miami soul song, “Read Between The Lines,” Walker can be an all-seeing spirited sage and then become the rogue in the Bobby Rush number, “I’ve Been Watching You.” Willie then comes back and interprets, “Not That I Care” a classic country song written by the great Cindy Walker, and makes one wonder why Ray Charles didn’t put it on either of his “Modern Sounds In Country & Western” LPs. Producer Rick Estrin’s “Is That It,” slides Willie into an uptown groove, which Walker handles with ease. His derision in that number is as believable as his heartache in the Cindy Walker song. His ability to convey the nuances of attitude and emotion between those two compositions are an example of Willie’s prowess as a soul singer. Willie and the band take their stab on the bent, “Funky Way,” a lesser-known gem by Georgia born Calvin Arnold. Once again, Willie is acting as an ambassador of the South, spreading the honey. Walker reaches further east than Georgia, crossing the ocean and taking on the Beatles’ “Help” with the aid of west coaster Curtis Salgado. Back in 1967, Willie cut “Ticket To Ride” for Goldwax, so this isn’t really uncharted territory.But where Walker is really in the pocket are on the two Eddie Hinton songs, “Everybody Meets Mr. Blue,” and “Hymn for Lonely Hearts.” Hinton too was drenched in southern soul. The pairing of Eddie’s songs and Willie’s voice go together like biscuits and gravy.